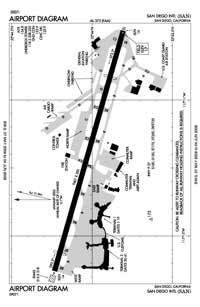 A110-16 TO REDUCE JET BLAST IMPACT AT N END OF TWY F ACFT WILL NOT START ENG UNTIL 800 FT FM N END OF TWY F; ABEAM THE SECOND PARKING PAD. A110-19 ULTRALIGHT ACFT PROHIBITED ON AP. A110-20 747 AND LARGER ACFT ARE PROHIBITED FM MAKING INTERSECTION TKOFS. A110-26 INTERMITTENT PRESENCE OF BIRDS ON AND INVOF OF ARPT. A110-3 TERRAIN & BLDGS TO 500' MSL N & E WITHIN 1 1/2 MI. A110-30 CROSS-BLEED ENGINE STARTS PERMITTED ONLY ON PARALLEL TWY WITH ACFT ALIGNED ON TWY CNTRLN. A110-31 OUTBOARD ENGINES OF FOUR-ENGINE ACFT ARE TO BE KEPT AT IDLE POWER FOR ALL GND MANEUVERING. A110-37 PILOTS REQUIRED TO CTC ATCT GROUND CONTROLLER PRIOR TO PUSHBACK, TOW OUT AND TAXI FOR TRAFFIC ADVISORIES. A110-38 MILITARY ACFT ON OFFICIAL BUSINESS ONLY CONTACT ARPT OPS AT 619-400-2710 FOR PPR. A110-39 ASDE-X IN USE. OPERATE TRANSPONDERS WITH ALTITUDE REPORTING MODE AND ADS-B (IF EQUIPPED) ENABLED ON ALL AIRPORT SURFACES. A110-4 PRACTICE APPROACHES AND TGL PROHIBITED. A110-40 TWY C EDGE LGTS OTS INDEFLY. A110-42 ACFT CROSSING RY 09/27 ON TWY C6, HOLD SHORT OF TWY C6 FACING WEST ON TWY C, PARALLEL TO RY. A110-43 DUE TO PAEW ON RY 09-27, 30 MINUTE PPR 0830-1230Z FOR ALL LANDINGS AND DEPARTURES CALL 619-400-2710. A110-44 30 MIN PPR (619-400-2710) FOR ACFT WITH OVER 171 FT WINGSPAN. A110-45 IN THE EVENT OF A DIVERSION OR IRREGULAR OPERATIONS EVENTS, ACFT OPERATORS CONTACT THE APT DUTY MGR (619) 400-2710 FOR PPR DUE TO LIMITATIONS ASSOCIATED WITH HANDLING DIVERTED FLTS. LIMITATIONS INCLUDE RESTRICTED GATE SPACE, CUSTOMS SERVICES AS WELL AS ACFT SERVICING & PARKING. A110-50 TAXIING ACFT ARE PROHIBITED FROM PASSING TO THE SOUTH OF ACFT LCTD ON TWY B INTO ALLEY LCTD BTWN GATES 7 AND 14. A110-51 TAXIING ACFT SHALL FOLLOW LEAD-IN LINES UNTIL THE NOSE WHEEL OF THE ACFT HAS ENTERED THE NON-MOVEMENT AREA OF THE ALLEY. 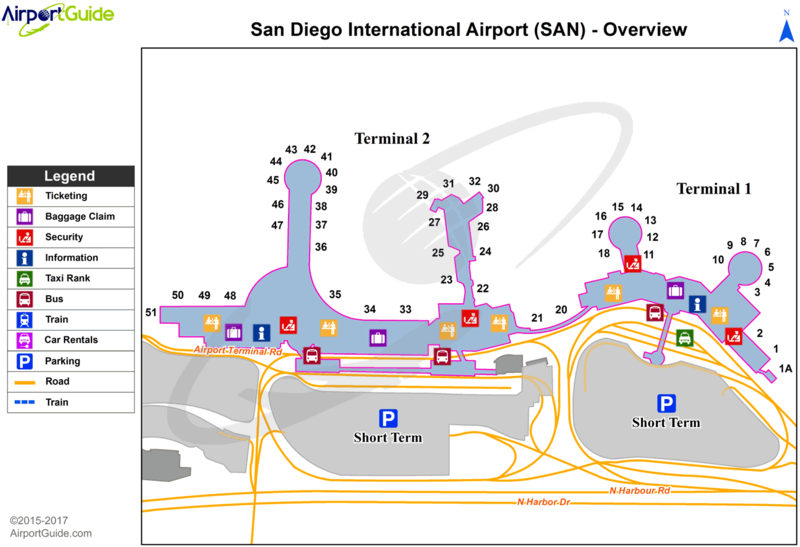 A110-52 FOR ACCESS TO/FR TERMINAL 2: GATES 23, 25, 27, 29, 31, 33-51 AND THE ISLAND AND WEST RON PARKING RAMPS, CTC RAMP CONTROL ON 129.775 FR 0600-2400. FR 0000-0600 CTC GROUND CONTROL ON 123.9. A110-53 TAXILANE A RSTRD TO ACFT WITH WINGSPANS OF 135 FT OR LESS. A110-54 TWY B1 RSTRD TO A MAX WINGSPAN OF 118 FT DUE TO CONST. A110-55 RWY 09/27 CLSD MON-SAT 0000-0500. A110-56 RWY STATUS LGTS IN OPN. A110-57 ACFT WITH WINGSPANS GTR THAN 171 FT (52M) RSTD FROM USING TWY D SOUTH OF TWY B, AND WHEN EXITING RWY 09 WB ON TWY B.
A43-27 PAPI UNUSBL BYD 5 DEG L & R OF CNTLN. A49-27 MALS RWY 27 THR TO 1400'. A57-09 APCH RATIO 44:1 TO DSPLCD THR. A57-27 RY 27 TREE 364' ABV RY END 6800' FM RY END & 1050' R OF RY CNTRLN; APCH 19:1 TO DSPLCD THR. A58-27 +40' LGT POLE 110' FROM RWY END 260' RIGHT.